We left Lobuche for good!!! We were to reach Gorakshep and trek to EBC and reach back Gorakshep. This was not going to be easy at all; we did reach Gorakshep on time, and stayed for some hot chocolate and left to EBC at 11.30 am. I knew we were starting late and that’s not good at all. The trek to EBC is the most strenuous one; we trekked up and down the ridge parallel to the deadly Khumba Glacier. Nuptse has 2 avalanches, the sound of the wind so scary and loud. After 1.30 hours of trek on the ridge we got into the moraine. Walking on the moraine can be quite depressing; debris over the blocks of ice only can rip your skin of if one had a slip. Many of the other trekkers were returning back, but very few actually went to EBC rest were either returning just before the moraine start or half way down. Subbu and I were together the rest of the 3 were quite behind with Maila. We had to reach EBC and return as quickly as possible ad even 5 pm would mean we had to use our troches to find the way back. Subbu and I reached EBC at 2.20 pm; we just had 2 more groups who had trekked with us. I was not sure if the rest of our team would make it hence I asked the guide for one of the group if we could join them on way back as we could get lost with out his help. Bit to my delight Sri, Keyur, Ajit and Maila were close, they reached EBC too. EBC had some 3 expedition teams who were attempting Mt Everest, the unforgiving Khumba ice fall and the entire glacier made me wonder if camp 1 is going to be tougher than the actual summit!!! We had a good picture session and smiles as we left. Weather was getting colder and it was only going to get worst. We got out of the moraine as quickly as possible, it was getting darker, and we took out our torches and started to move together. At one stop we almost walked into a lake, Maila called us change direction; we were really tired weather was not helping at all. We reached the hotel at 6.30 pm and just wanted top have dinner and hit the bed as we had to go up to Kala Pattar early and trek back to Pheriche. Morning, only Subbu and I were ready to go to Kala Pattar the rest of the 3 decided to trek down towards Pheriche. So we left to Kala Pattar along with Maila, it looked like a steep climb so was it, really steep. 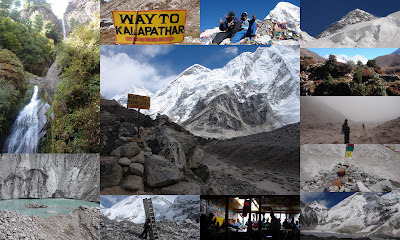 Kala Pattar gives the best view of Mt Everest and it was worth the effort to fill my eyes with the Mt Everest. We were on the top of Kala Pattar i.e 5545 mts by 9 am and just clicked our cameras will the fingers started hurting it was beautiful and I did not wanted to come down, but we had to move quickly. We reached the hotel at 10.30 am, had breakfast and within no time we were back on the familiar trail. Not sure what got into us we were in Pheriche in 4 hours flat. We realized that Sri, Ajit, and Keyur had not reached yet, first though was if they had missed the route, Maila went looking and was back with the rest, we just had missed them in Dughla, as Ajit had a bad stomach they were inside a hotel and we left from outside after having some tea. Pheriche is beautiful, as you entry into the valley, surrounded by green hill and the one covered with snow, it open’s up to the sky and it’s a great view. The place is very silent, it not as big as Namche but has facilities like hospital, heli service. Now that the mission was completed we were more relaxed and went to bed early, as we had a long trek to Namche. As we reached Namche I looked back for one final view of Mt Everest and truly was not happy to leave, but we are travelers we leave only to come back. We also met the team from Pune finally and was glad to chat with the. Later we also bumped into those three people from West Bengal, they were worn out completely. Stay in Namche was very comfortably, may be all the pressure was gone and the trekking was going to end in just a day. Many of the other trekkers were also reaching Namche, some were staying over for an extra day too. Next morning we were ready for the grand finale, reaching Lukla from Namche was going to take a lot of time and energy, but we were going down on the altitude and weather would get better. We walked as if there was no tomorrow, and reached Lukla just in time for dinner. Our fight to Katmandu was the next day morning and we had one last sleep amidst the mountains. It was all over, we reached Katmandu!!! A great trek and for many it was once in a lifetime!!! We at BASECAMP will continue doing these treks, bringing together many of you how would dream to do these treks.